When watering ensure the Seedbom is gently soaked all the way through, you can tell it’s really soaked when the biobased shell starts to really soften (think of cooked pasta). If your Seedbom is not soaked through there is a good chance it won’t break open effectively. Seedboms like to be kept damp, try not to let them dry out and don’t over-water and drown the seedlings. A good rule of thumb is damp to the touch but not soaking wet. Seedboms like to be warm, not too hot, the warmth from the sun is ideal. Too hot and the Seedbom will dry out and there is a danger of the seedlings dying. Too cold and the seeds may not germinate at all. When choosing the perfect growing site, look for bare open ground with little or no weeds, weeds will compete with the seedlings and stop them from establishing into strong and healthy plants. 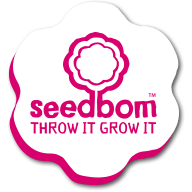 Seedboms can also be grown in planters, pots or window boxes. Simply soak as normal and place on top of well drained soil, then split open by hand to allow seedlings to grow out. P.s. All instructions can be found on the inside of the Seedbom packaging sleeve. Want to know more? Take a look through our FAQ page to see if your question is answered there or contact us and we’ll be happy to help.